We fell in love with today's Shoe of the Day while attending FFANY. 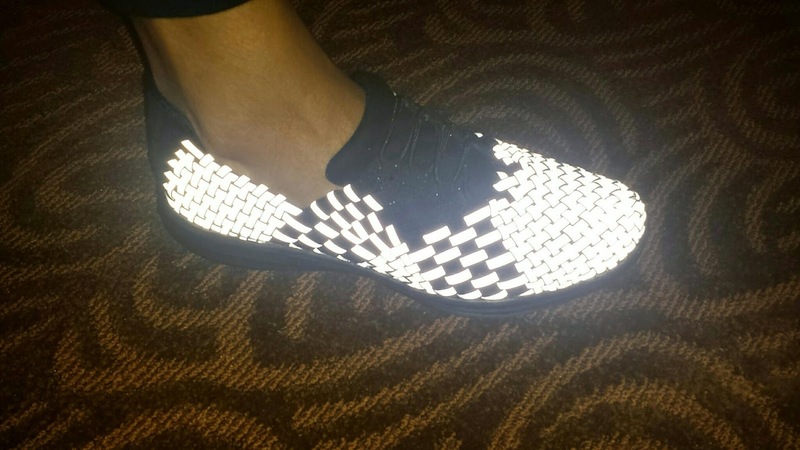 As you can clearly see, this very cool sneaker is reflective, perfect for those dark streets. We've seen lots of reflective technology added to activewear to protect nighttime runners/walkers to great results and this all-over reflective shoe won our hearts. Say hello to the Bernie Mev Reflective Victoria Woven Sneaker, an incredibly lightweight sneaker that conforms to your foot thanks to its woven elastic upper. This stretchy basket-weave pattern makes the shoe breathable, holds your foot in place for a great, comfortable fit, and stretches to accommodate various foot shapes (so no more having to buy medium vs wide widths). Other cool features include bungee laces for easy on/off, soft, memory-foam like insole, and a flexible cushioned traction sole keeps your foot comfortable all day, making this great for walking the city. The Victoria comes in lots of colors and retail for about $80.00 or less, get them at Nordstrom, Peltz Shoes, shoebuy.com, and amazon.com.